Karate Pig is a professional martial arts pig who knows all about the martial arts. This is why players will be transported into a world of Martial Arts with Asian symbols everywhere. These symbols will land on the game’s 5 reels and the 40 paylines that the game has. All of the symbols come in amazing visuals that help depict the theme of the game in order for players to enjoy an immersive and an exciting gaming experience that is like none other. 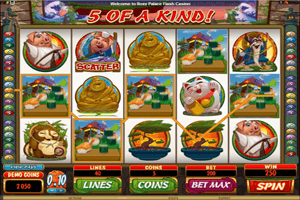 Play Karate Pig Slot here. The symbols include the Karate Pig, the logo of the game, an Asian lady, a martial art, a tree, a golden coin, a cat, sushi and an Asian temple. These different symbols pay players in different line payouts, players can check them out at the paytable of the game by clicking on View Pays. The paytable would also show players the different special symbols that the game has in store. For example, there is the wild icon which is the game’s logo. It can substitute for other symbols on the reels of the game to aid players in creating a winning combo. The Karate Pig bonus symbol can trigger the Karate Bonus when at least three of these symbols land on the reels in any positions. Players will go to a second screen where they can enjoy the Pork Shop or the Hammer bonus and earn karate belts. The Golden coin on the 1st and the 5th reel will trigger 15 spins.